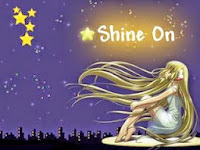 I'd like to thank Dorothy of Sewing Fun Things for nominating me for the Sunshine and Shine On award. 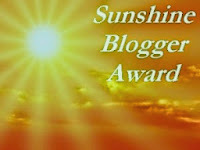 This award is meant to help you get to know your fellow bloggers better and network with other bloggers, as well as reveal fun facts about you to help your readers know you better. For the last couple of years, my preferred exercise has been hooping! I've come back to regular, frequent sewing after many years of just doing a bit here and there -- what was I thinking?! I love tea. I mean, love it. Oh now I must check out your book blog! I can always use a new book source! I see you use Goodreads too -- I love to talk books, thus my blog and Goodreads etc. Always fun to find new suggestions! Your life is interesting! I truly understand coming from being an elementary school teacher. I love the library as I worked in the library during high school and college.